But Mary stood weeping outside the tomb. As she wept, she bent over to look into the tomb; and she saw two angels in white, sitting where the body of Jesus had been lying, one at the head and the other at the feet.They said to her, “Woman, why are you weeping?” She said to them, “They have taken away my Lord, and I do not know where they have laid him.” When she had said this, she turned round and saw Jesus standing there, but she did not know that it was Jesus. Jesus said to her, “Woman, why are you weeping? For whom are you looking?” Supposing him to be the gardener, she said to him, “Sir, if you have carried him away, tell me where you have laid him, and I will take him away.” Jesus said to her, “Mary!” She turned and said to him in Hebrew, “Rabbouni!” (which means Teacher). Jesus said to her, “Do not hold on to me, because I have not yet ascended to the Father. But go to my brothers and say to them, ‘I am ascending to my Father and your Father, to my God and your God.’” Mary Magdalene went and announced to the disciples, “I have seen the Lord”; and she told them that he had said these things to her. Early in the career of Christian singer Amy Grant, she found that her group had been offered a chance to play at an amusement park in Virginia. She was told it was only for $500, but that it would be good publicity. Sometimes something comes along and it changes everything. The resurrection of Jesus Christ is one of those things, although sometimes I don’t think we appreciate how much actually changes. It is early Sunday morning, and I want to invite you to come on a journey with me. We will not be traveling alone; we have a few companions this morning. Mary, John and Peter. And we are going to travel to the Tomb with them. We are going along with them to pay our respects to Jesus, a fine leader, but one who was found to be a failed leader, because the authorities arrested him, and killed him. So I invite you to come to the tomb, with Mary john and Peter. This morning. I invite you to come with me on an Easter journey. Like the disciples we start our Easter Journey at the tomb, which is a strange place to start because we know what tombs are for—dead people. They are a sign of death. But that is where we start because on this day the world is turned upside down and at the time we something completely unexpected—life. New life. The new creation. We do not find death at the tomb. But what do we find? Where is Jesus? Mary is confused. She has gone to find a dead Jesus, and when she does not find a dead Jesus, she doesn’t know that to do. God is not where she thinks God should be. Often our Easter experience starts when we ask, “Where is God? 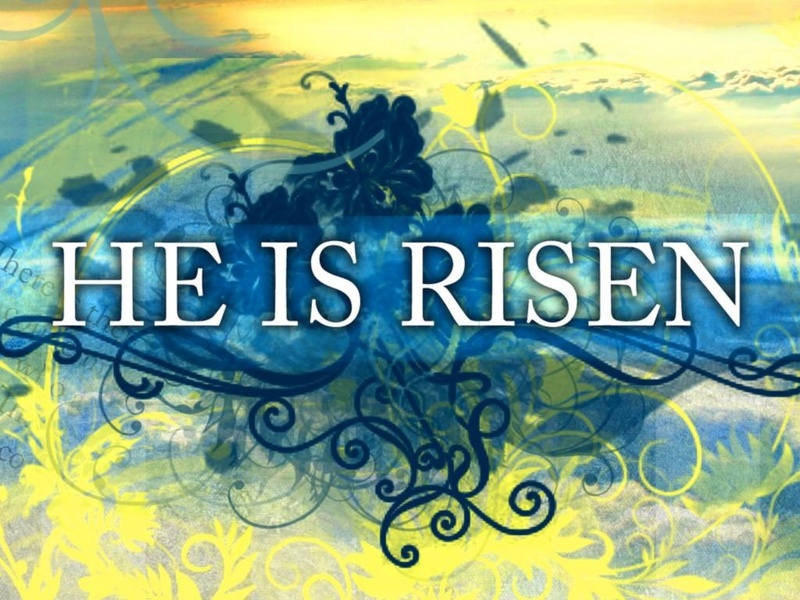 He is not where we left him!” Everyone expected Jesus to be in the tomb. After all, when you put a dead person somewhere, you pretty expect them to stay where you put them. So Mary goes to where she knows God is, where she knows Jesus is, only to find that He is not there. Let me ask you a question—is Jesus alive for you? Think carefully before you answer. A dead Jesus is a pretty easy Jesus to maintain. You always know where he is, he never pulls any surprises, and he is pretty predictable, as most dead people are. But a live Jesus—now that can be a problem sometimes. The people around Jesus are always having problems with him. There he goes, healing on the Sabbath, talking about God as if He were God’s best buddy, hanging out with all sorts of unsavory characters. A live Jesus is not an easy Jesus to have around. Mary found that out. She came to the tomb, expecting him to be there, and Jesus pulls the unexpected out of his hat. He is not there. He is not dead. Sometimes we can only find the risen Christ by discovering where he is not. In order for Mary to experience Easter, she has to experience what some call the Dislocation of God. We all grow up with concepts of who God is. Some of these may be pretty helpful, others may not be. We got comfortable with our conceptions of God. But hear me now…Every conception we have of God is incomplete at best. The reason for that is that God is much bigger than we can ever imagine God to be. Our language is not big enough to contain God. Later Jesus is going to tell Mary not to hang on to him. There is a lot of controversy over what he meant there, but let me venture a guess. She is glad Jesus is no longer nailed to a cross, but now she wants to nail Jesus’ feet to the floor. Now that she finally has him, she wants to hang on to him. As long as she is holding on to him, he can’t pull any more tricks on her, like dying and rising from the dead. But you can’t do that. You cannot place your limitations on Jesus. You just cannot hang on to him. As much as we might love him, as much as we might want him to say where we are, as much as we feel we have to have him where we want him, we cannot hang on to him. It is just impossible. John has a different experience at the grave. He looks in, and the story tells us that he believed. Now, John is writing the story, so he knows what is going on. We don’t know exactly what he believes, but we are told he believes when he sees the empty tomb. Perhaps as he was looking in there, looking at the empty tomb, he started to remember all that Jesus had said. He started to remember that Jesus told them he would rise on the third day. He started to remember and he started to believe. Some people come to faith, come to the risen Christ pretty easily. Faith is not a struggle for them. Some have had an overwhelming experience of God’s power, some were raised in the faith. But for some people, faith comes easily and naturally. If you are that type of person, the praise the Lord! John saw, and he believed. It was just that simple. John immediately sought what was above, what was beyond his understanding. John was willing to let go of all his preconceived notions of life and death. Peter had yet another experience. He saw the empty tomb, and he ran off looking for Jesus. We don’t know where he went. John tells us that some of the disciples went home. They did not know what was going on. They were clueless on Easter morning. Later Jesus is going to appear to them. But not this morning. This morning they just get the word he is missing. They don’t know what that means yet. They don’t know how things have changed. But they go home and they wait. There are probably plenty of times when we don’t know what the risen Christ is up to. Something is happening, and we don’t know what it is. The world is swirling around us, and we don’t really have a clue what it all means. After my mother got an answering machine, she found out not everyone knows how to use them. She was visiting my Grandmother, her mother, and she said to her, “Sue, I called you yesterday, and I got that machine. It kept asking me to leave my number. You KNOW my number! Why did it keep asking me to leave it, when you already know my telephone number?” My grandmother just didn’t quite understand the nature of an answering machine, and Peter did not really understand the nature of the Empty Tomb. Peter didn’t quite get it. He saw the empty tomb, and he went home. Maybe he just didn’t want to deal with it. Maybe he still felt guilty about denying Jesus. Maybe he just was confused. Maybe he was clueless. In any case, he went home. We certainly should not judge Peter. After all, he didn’t have almost 2000 years of Easter Sundays to fall back on. As a matter of fact, he didn’t have any! This was brand new territory for him. So we can’t blame him for not getting it. Maybe he didn’t have a clue, but there weren’t too many clues to be had. Later, Peter is going to have a close encounter with the Risen Christ. He is going to be fishing, and Jesus shows up and makes him breakfast. And he gives him a little talk—a very important talk. Peter goes home, he goes to what he knows, which is fishing, and there he runs into the Risen Christ. We run into the risen Christ in many different arenas of life. Have you ever seen the risen Christ at work? Or at School? Have you ever seen the risen Christ in the wilderness? Or have you seen him amongst friends? At work, at play, with friends, family or when we are alone, the risen Christ lifts us up. To seek the things that are above does not mean that you have to have a religious job, and religious friends, and vacation at religious resorts, and always be praying in your spare time. To seek the things that are above does not mean that we are always religious. But it does mean that we are always prepared to encounter the love of God, no matter where we are. It means that we strive to understand that every moment is a sacred moment. Every moment is a gift from God. And the Risen Christ is present with us at work. We don’t need to bring Christ into our workplace…Christ is already there! We don’t need to bring Christ into our schools. Christ is already there! We don’t need to bring Christ into our families. Christ is already there! We just have to learn to see him. Let’s go back to Mary. John believes, and he goes home to wait and see what will happen. Peter is clueless and he goes home. Mary stays. She came here to see Jesus, and by golly, she will see him. Her confusion turns to grief. She sits outside the tomb weeping. And the risen Christ comes to her through her tears. She is weeping, so much that she hardly notices the angels at the tomb. I see her huddle on the ground, a little puddle of despair. Through her tears she sees a gardener, and thinks, “Maybe he know!” She begs him to tell her where they have taken Jesus. And then she gets the surprise of her life. She hears her name. “Mary.” And it is a familiar sound to her ears. It pierces her grief. The risen Christ enters into her suffering, for he has now suffered. And he raises her up. In my mind, I see Jesus reaching down to Mary, holding her by the chin, and slowly raising her up. Jesus lifts her from her grief, and takes her to a new place. And she is transformed. Jesus enters into our tears, and into our suffering. We don’t always see him there, but he is there. We find inexplicable moments of grace, flashes of insight, answered prayers, strength that we did not know we had. And Christ is lifting us up. In our grief we ask questions…good questions. Why? That is a hard one to answer. But Christ helps us struggle with the answer. Why is it so hard for me to love? Why is it so hard for me to believe? Why do I not see Jesus? Why are all these things happening to me? Through our tears we do not always see Jesus. Through our pain, we do not always see Jesus. And when we do, we don’t always recognize him. We think he is the gardener. But often, through the tears, we see the Risen Christ. Who shares in our suffering. I once traveled to Stromboli, which is a volcano off the coast of Sicily. We planned to hike to the top, and camp out up there, which we did. We found a trail leading up, and it was a hard hike. It was hot at the bottom, but cold and foggy at the top. It was a volcano, which meant we were hiking mostly in cinders, which meant you took two steps up, and slid back a step. We finally got the top, set up our tent, and settled in for the night. Smoke and ash from the volcano swirled around us for hours, the wind was blowing fiercely, and we hunkered down in our tent. Finally the smoke and ash cleared around nine, and we could hear the volcano erupting, so we heading down the ridge where we were camping to see it. There we ran into a Swiss tour group. The people in the group were much older than us, they had no hiking gear, and no camping gear. It was dark, and we wondered how they would get down the mountain. We asked them how they got up, and he pointed to a bus that was on a road that led to the summit. For these people this was a leisurely stroll. We took the hard way, they took the tourist route. We both ended up in the same place, but for us it was an arduous ordeal getting there. For them it was a tourist stop. We were in the same place, and we were both enjoying being there, but we each took a different route. And so we each had a different experience of the mountain. For me reaching the summit was a triumph, something to celebrate. For the tourist, it was just another stop on the tour. One of my colleagues and friends, Curt Karns, tells of two hikers who had similar experiences. One had to fight his way through devils weed and rock cliffs to get the top of a mountain, and the other just ambled up an easy trail. The one who struggled up got the top and shouted in victory, “HALLELUJAH, PRAISE THE LORD I MADE IT!!! !” The one who just ambled up was sitting in quiet meditation, and was a bit disturbed by all the hoopla the other person was making. The same place, different routes, different experiences, and different ways of appreciating where we are. The spiritual life is like that. We all experience the risen Christ differently. Your experience is not my experience, and so your reaction to the risen Christ will be a little or maybe a lot different than mine. And at different times in our lives we will experience the risen Christ differently. But he comes to us. He comes with grace and hope and love and peace. He comes to heal. He comes to be with us. He comes to raise us up beyond our circumstances, and into a new life. He comes, and that changes everything. This entry was posted in Resurrection and tagged Christianity, church, Easter, Jesus, Resurrection. Bookmark the permalink.